NoMachine Enterprise Desktop is a game-changer for both businesses and professionals in the remote desktop access arena. It not only offers the most extensive features available in a secure, remote access software, it supports cross-platform communication for a variety of combinations. Install it on any device and connect to Windows, Mac, Raspberry and Linux computers wherever those remote hosts are. Perfect for providing unattended access for IT admins, it's also the ideal tool for mobile professionals that need to log into their office desktop from anywhere and access applications and important files from their laptop, tablet or even smartphone. Enterprise Desktop lets mobile staff securely connect to their PC at work and facilitate collaboration through secure sharing of files and folders, enable reliable remote assistance via desktop and web whether they’re in the office, at home, or on the go. Being able to securely and reliably access business files and documents from anywhere is crucial for organizations if they want to maintain their competitive advantage in today's world - one that literally moves at the speed of light. For many employees these resources are on a desktop which is somewhere else - at HQ in the next town, on a VM in another country, hosted on a cloud-based service by a provider and so on. Enterprise Desktop simplifies the remote working experience by letting users access their desktops deployed in the data center or cloud even through an HTML-enabled web browser. Anywhere access to business desktops is also dead easy to set-up and operate. Just install the software on a server and add the machines you want to connect to from remote on your private network. A tremendous simplification compared to all similar software on the market. The idea of a desktop or application that you can access from any computer or device is now a reality in the modern enterprise. Expensive personal workstations have been replaced by cloud-based resources which can encompass USB devices, CPU, memory not just virtual machines running a myriad of virtual desktops. Offering a cloud-based desktop means that complex software configurations can be centrally managed and hosted on on high-powered server hardware. Employees can use low-powered PCs or tablets to access these business desktop environments on-demand and from anywhere, but the remote computing experience must look and feel like a local PC, and give real-time response, regardless of the connection scenario. With NoMachine Enterprise Desktop your remote desktop is responsive, functional and rich as if you were actually in front of your computer. Not only the screen, keyboard and mouse, but all devices available on the server and on the client work on your remote desktop as if they were physically connected. With Enterprise Desktop the network transparency dream comes true. All your folders, drives and devices work as you expect. You can print a file located on the remote computer to a local printer or do the opposite. You can make a bar-reader connected to the client appear as if it was connected to the server, so that your store application in the server farm immediately works. Pendrives, scanners, any USB device is ready to use. Obviously you can control what device is made available, so that security and privacy are never compromised. It's possible to publish any desktop operating system with NoMachine. We consider physical desktops all desktops that are either really physical (i.e. they are running on physical hardware) or that are running as physical desktops inside a virtual machine. This latter case includes instances of operating systems running inside VMware, Xen or KVM virtual machines or in Docker containers. To support multiple users you run multiple VM instances safely on the hypervisor host depending on the number of CPUs and memory available. You install and run NoMachine Enterprise Desktop inside each VM instance as you do on a physical computer for the individual user. 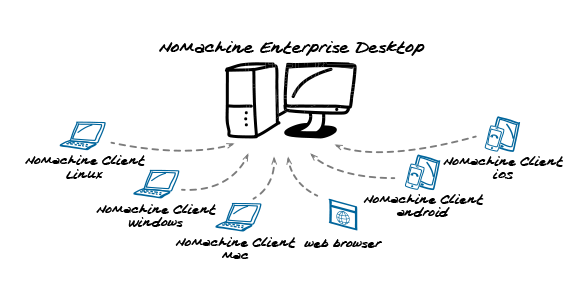 Enterprise Desktops can function as standalone servers, or you can choose to consolidate access under one entry point, via NoMachine Cloud Server. Your NoMachine desktop installment grows together with your requirements. Start small and add more and more, as your needs change. Add more Enterprise Desktops to a single or clustered Cloud Server, for infinite scalability. All your desktops, on physical and virtual machines, can work together with the same ease and the same tools, across the board, to serve your users wherever they are. NoMachine products work with any Virtual Desktop Infrastructure, offering the same ease of use on VMware vSphere ©, Microsoft Hyper-V ©, Citrix Xen ©, and KVM based virtual-machines, regardless of whether they're running in a datacenter or in cloud. Cloud-based desktops, like those hosted on Amazon EC2 ©, Rackspace ©, Google Cloud © or Azure ©, are rapidly becoming the norm for businesses which want simplicity, flexibility and scalability from their IT. A hosted desktop in a VDI environment running on a cloud infrastructure mimics the traditional desktop environment but as a Desktop as a Service (DaaS) model, simplifying the challenges of deployment, data security and how to keep HW costs low. Benefits to organizations and administrators of cloud-based DAAS are well-documented, but what about users who need access to those desktops? How do you ensure remote users get the best possible experience and performance when connecting to their remote desktop just as they would as if the physical hardware was really theirs? Cloud infrastructure providers have ways to initiate remote control sessions from within browser windows, or tech-savvy users can start remote desktop connections: SSH for Linux, RDP for Windows, FTP if you want to transfer files. This can often be cumbersome. Enterprise Desktop simplifies connecting for everyday users, not just for admins, by providing an intuitive interface with easily accessible functionality from within the desktop session. Enterprise Desktop, like all NoMachine software, is cloud agnostic and integrates seamlessly with Amazon EC2 or Rackspace as it does with Google Cloud or OpenStack. Once installed on cloud-based Mac, Linux or Windows instances, it's the simplest form of remote access for users of all devices, and even clientless endpoints through means of a web browser, providing a comprehensive set of features across all operating-systems and giving users what they want: a single intuitive tool with optimized user experience with all the associated bells and whistles: clipboard, file transfer, audio, video, session recording, USB redirection, GPU acceleration and so forth. Enterprise Desktop comes with annual support options and software updates. For complete details about the functionalities available, please consult the links below. Let employees remotely access Windows, Mac and Linux desktops from wherever they are, including with any HTML-enabled browser. Perfect for remote collaboration or help desk activities, these desktops can be standalone or combined with NoMachine Cloud Server. Enterprise Desktops can also be added to a Cloud Server at a later time, allowing you to centralize access to all your resources via a single gateway, securely and reliably, through a consistent user interface on all operating systems.